Michael Burlingame, editor, Lincoln’s Journalist: John Hay’s Anonymous Writings for the Press,1860-1864, p. 33 (February 16, 1861). Henry Villard, Lincoln on the Eve of ‘61, p. 88. Roy P. Basler, editor, The Collected Works of Abraham Lincoln, Volume IV, p. 130 (Letter to Abraham Lincoln from Grace Bedell, October 15, 1860). 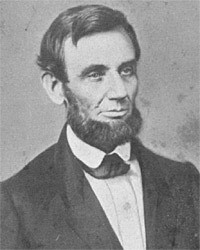 Roy P. Basler, editor, The Collected Works of Abraham Lincoln, Volume IV, p. 129 (Letter from Abraham Lincoln to Grace Bedell, October 19, 1860). Roy P. Basler, editor, The Collected Works of Abraham Lincoln, Volume IV, p. 219 (February 16, 1861). Victor Searcher, Lincoln’s Journey to Greatness, p. 118.